About time I tried something different. So found this in a local store and thought, hmmm, Australians don’t do many ales surely. They’re all lager. It’s standard. Plain. Refreshing. A bit citrusy. Not sure I would call it an ale, but a rounded lager. It would rate very highly as a lager. There’s not much in a way of flavour but it would certainly do in a hot summers day picnic. Okay I say. But that’s it. 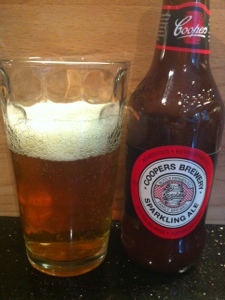 This entry was posted in beers and tagged ale, coopers, sparkling. Bookmark the permalink.